Computers seem to be replacing humans across many industries, and we're all getting very nervous. But if you want some reason for optimism, visit your local supermarket. 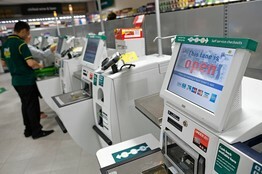 See that self-checkout machine? It doesn't hold a candle to the humans—and its deficiencies neatly illustrate the limits of computers' abilities to mimic human skills. Computers seem to be replacing humans across many industries, and we're all getting very nervous. But if you want some reason for optimism, visit your local supermarket. See that self-checkout machine? It doesn't hold a candle to the humans-and its deficiencies neatly illustrate the limits of computers' abilities to mimic human skills.